Thank you so much for the space in your magazine for my article on Fish Haul Farm in Port Royal Plantation. There were two things I noticed when reading the article. 1. You didn’t give me credit for the photos or the writing. That made me sad as I spent a lot of time writing that article and I wanted to brag about it to my family. 2. Tractor Supply Company should have remained capitalized per my submission as it is a store. Actually, Tractor Supply Company is the largest retail farm and ranch store chain in the United States with over 1100 stores in 38 states. The reason I wanted to go to that store was each store team includes welders, farmers and horse owners who collectively provide an exceptional depth of knowledge and resources, something we needed for our farm. I realize now I should have italicized the name to avoid confusion and the editing pen. Other than that, I was very pleased and we deeply appreciate the space you devoted to us. I was out with Kim Crouch the other night and I shared this pic with her, but I wanted to pass it along to you too! That is indeed the Sept Issue of CH2 that my Great Dane Georgia was lounging around checking out. All the random things on the bed were meant to keep her from sleeping on it… but she found it to be a great place to read a mag! Just wanted to share with you too! 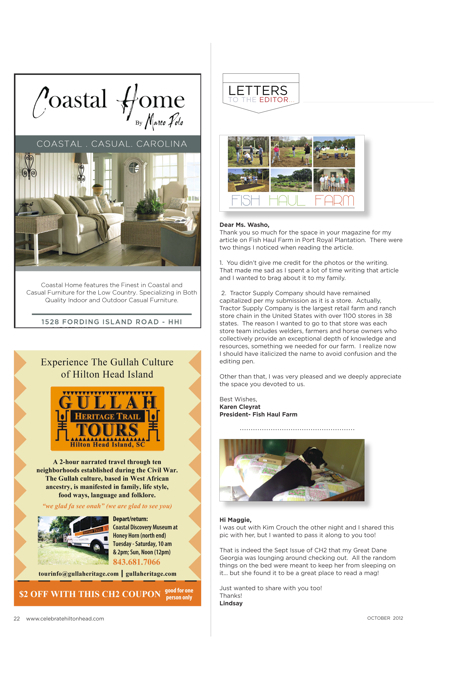 Thank-you so much for featuring the Zonta Club of Hilton Head’s “Take a Stand Walk” flyer in your recent eblast. We have already heard from many in the community who saw the blast and plan to participate in our walk to end violence against women. How inappropriate for the class of our island to be displayed on a coffee table in so many businesses throughout Hilton Head/Bluffton and also in homes where children can see these displays. Besides, who watches Survivor anymore, it is hardly America’s favorite reality show. Come on, our island is beautiful, we should be promoting all the wonderful golf, beaches, kayaking, parasailing, zip line scenes and the beautiful people that live here, not snakes and alligators wrapped around a swamp girl. On behalf of the Hilton Head and National Board of Operation R&R, I would like to thank St. Francis Thrift Shop for their generous contribution to Operation R&R. For the last two years St. Francis Thrift Shop has been a great help to Operation R&R and many other local charities. St. Francis Thrift Shop is truly a blessing in our community.